With some world-famous runs, epic off piste and vibrant nightlife Val d’Isère has deservedly earned a reputation as one of the world’s best ski resorts. And it’s easy to see why. With neighbouring resort Tignes it forms the Espace Killy ski area, renowned for it’s high altitude terrain, and the resultant impressive snow record. Although it’s not just the altitude that makes Val d’Isère such a snowy wonderland. It’s helped by its location alongside the Italian peaks just over the Col d’Iseran. Word is this creates it’s very only microclimate, such that all the surrounding resorts can have clear skies when it’s dumping in Val d’Isère and the wider Espace Killy. Which is great news for powder hounds! And for skiers and boarders of all levels in fact. As even in very dry seasons across Europe Val d’Isère seems to retain a good covering throughout the season which normally runs here through ‘til May. No wonder we decided to open a ski school in Val d’Isère! Aside from the amazing snow, what is that brings holidaymakers flocking to Val d’Isère? The variety of pistes certainly help. 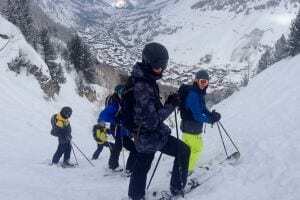 And although Val d’Isère is often touted as an advanced resort there are still a number of beginner areas as well as plenty of blues to keep the intermediates happy. The other thing that Val d’Isère offers is a picture postcard town centre and bustling nightlife to keep people of all ages partying long after the lifts are shut! Val d’Isère has three main areas: Val d’Isere Centre (1850m), Le Fournet and La Daille. La Daille is the first little village you come to after leaving the mountain road. 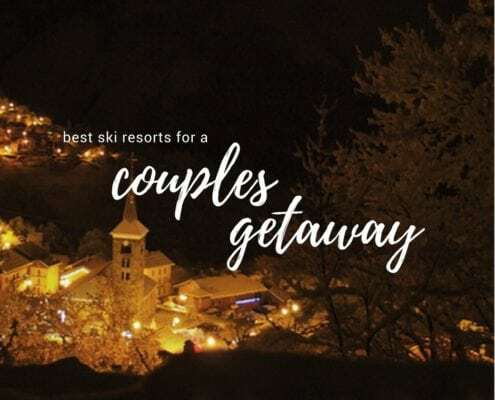 And although not the prettiest of villages due to its towering apartment blocks it does offer value for money accommodation for the more money conscious visitors and is ideally located in between Val d’Isère and Tignes. In contrast, Le Fournet is the quaint village just after the main town of Val d’Isère which still shows it’s roots to the area’s farming past. Buildings are chalets here are built using traditional stone and wood, as is the Savoyard tradition. The area of Le Fournet is also the gateway to some of the best off piste in Val d’Isère, making it an ideal base to clock up some serious ski miles! Find the lesson that suits you with our Val d’Isère Ski School. Click on the image to download a high res Val d’Isère and Espace Killy piste map. Val d’Isère and neighbouring resort Tignes form the infamous ski area of The Espace Killy. They offer 300km of pistes to explore with natural and high-speed links between the entire area, making queues unusual except in the busiest weeks. For intermediates, Espace Killy offers a wide range of terrain and a number of nursery slopes for those starting out. But it’s for the more advanced that the area stands out from the crowd. With 25 black runs, including the well-known Face and endless off-piste, Val d’Isère really is a mecca for advanced skiers and snowboarders. The terrain here is steep so it’s said that a blue in Val is likened more to an easy red elsewhere so take it easy on day one. The ski area of Val d’Isère is split into four main areas: Solaise, Bellevarde, Le Fournet and La Daille. Then there is much more to explore over in Tignes including the Grande Motte glacier so you’ll certainly earn that cheese feast for lunch! Beginner Areas – There are three designated beginner areas: one in the centre of resort, one in La Daille and up the top of Solaise. Solaise – Ski the blues around the top of Solaise before taking the lift down. Col d’Iseran – Ski down from the top of the Col d’Iseran from the top of Le Fournet. La Face – The famous run is not for the faint of heart, but definitely worth a go. Le Fournet – Head here to explore the incredible off-piste terrain. Victors – Warm and relaxing atmosphere of this restaurant situated inside Langley Ski Lodge. Serving a mix of Asian dishes, grilled meats and a delicious burger that we recommend. Chez Paulo – Quality Italian food with a huge variety of pizzas, pasta & lasagnas. Beware it does get quite busy here. Le Lodge – They’ve got something for everyone at the traditional Le Lodge. Savoyard dishes, meats, fish and pizzas – all for a reasonable price. Fondue Factory – A unique fondue experience in this concept restaurant. Decorated in vintage ski equipment mixed with a modern, Alpine feel, you can enjoy one of their 15 different types of fondue on the menu. And then cap it off with chocolate fondue dessert! La Casserole – A classic, cozy Savoyard restaurant to get some local favourites. Raclette, tartiflette, croziflette, and fondues are all on the menu along with their signature ‘Casseroles du Chef’. Tavern d’Alsace – French cuisine and Alsacian regional dishes with a varied menu and relaxed atmosphere. Situated inside the Hotel Kandahar. La Baraque – High-quality food, great ambiance, and live music – you really can’t go wrong. They serve a mixture of French and international cuisine. You will pay a bit more here for your meal, but it’s definitely worth it! L’Atelier d’Edmond – If you really want to splurge, check out this Michelin star restaurant in Le Fornet. With set menus starting from 125€. 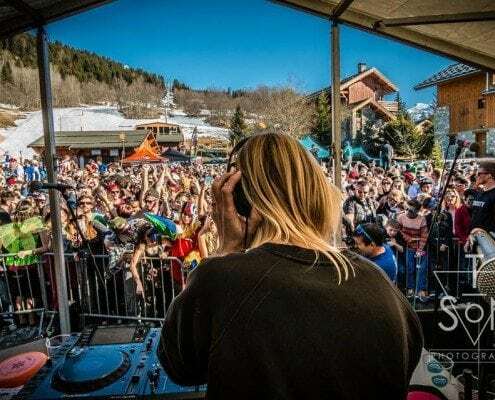 Amongst amazing skiing and delicious food, Val d’Isère also knows how to party. You will not be a loss for some great après and nightlife spots in Val. Here are our favourites. 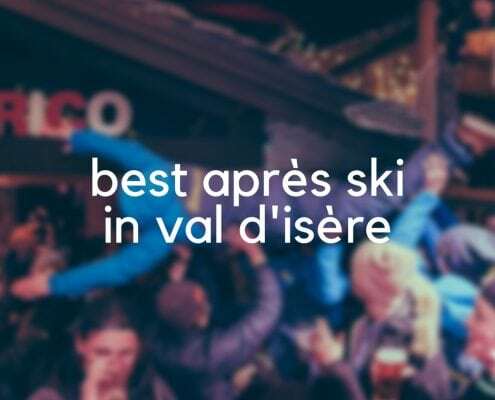 Cocorico – A stint in Val isn’t complete without an après at Cocorico. Head here for live music and then DJ until 8 PM closing. Chez Jules “Le Coin Des Amis” – A great atmosphere in centre which locals and tourists both love. Head here for an après session. Fall Line – Après and nightlife. Often have live music and events. Try the Espresso martinis and flat white martinis. Dicks Tea Bar – Always a winner if into nightlife. Younger crowd with great DJs. Doudoune – Situated just below Cocorico. Club 21 – Best on 21st of each month. Always a great party. Many big names come to do sets recently such as Rudimental, Mark Wright and Roger Sanchez. Chalet holiday specialists. They have a range of chalets in Val d’Isère. Highly recommended. Great for groups. They recently put in a large hot tub! Holidays without compromise. Chalets at the ‘higher’ end of the market. Run a small operation in Val d’Isère with two great chalets. Chalet holidays ‘tailor-made for you’. More than 40 years ski holiday & ski chalet experience. 2 chalets in Val d’Isere – all fitted with ‘detox facilities’ including log fires, hot tubs, and saunas! A number of good value chalet hotels in Val d’Isère. The staff always make it a wicked holiday for their guests. Self-catered apartments and a catering service! One of the original chalet companies in Val d’Isère. YSE has twenty of Val d’Isère’s best chalets, from comfortable to sumptuous. Firefly Collection offers a cherry-picked selection of the finest luxury ski chalets, together with expert, impartial advice, and a complimentary concierge service. Flexiski offers tailor-made holidays across the Alps. Catered and Self Catered Chalets & Apartments in the French Alps. Active holidays direct from Independent Operators. Arrange luxury ski holidays; chalets, apartments, hotels- whatever your heart desires. 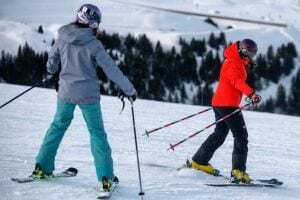 Ski Holiday Company – run by skiers for skiers. 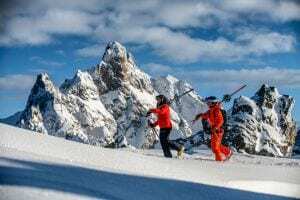 Ski deals and cheap holidays with the biggest tour operators in Val d’Isère. An up and coming ski agency who will find you exactly what you want! Best prices, best advice. A specialist chalet agent with a wide range of catered chalets to suit all budgets. A unique and personal service, going the extra mile to ensure your bespoke ski holiday is perfect. Specialist Accommodation Agent for the resort of Val d’Isère with 150 chalets, 300 apartments, and 30 hotels. Where can I get my skis and snowboard equipment? Snowberry is without a doubt the best place to hire your skis. They have top quality new equipment for all levels with added services in their Premium Range or rock bottom-deals on slightly older skis in the Low-Cost range. They have over 40 native English-speaking staff, professional boot fitting, unlimited changes, free overnight ski storage, and courtesy transport. You can check out the latest snow conditions on the official Val d’Isere site. A useful website with information about resort, as well as snow reports and useful tips and advice. T4 offers a private nanny service in Val d’Isere, Tignes, Meribel, Courchevel, La Tania, La Plagne, and La Rosiere. They hand pick nannies who share the belief that undivided attention, fun and getting involved are the key ingredients to a happy family holiday. Entwining passions for travelling and natural learning, each child’s holiday is filled with play and creativity. Parents can explore the mountains knowing their children are safely cared for.